GitHub for Visual Studio 2.3 was recently released and it brought new functionality that now allows you to add pull request comments directly from the IDE. 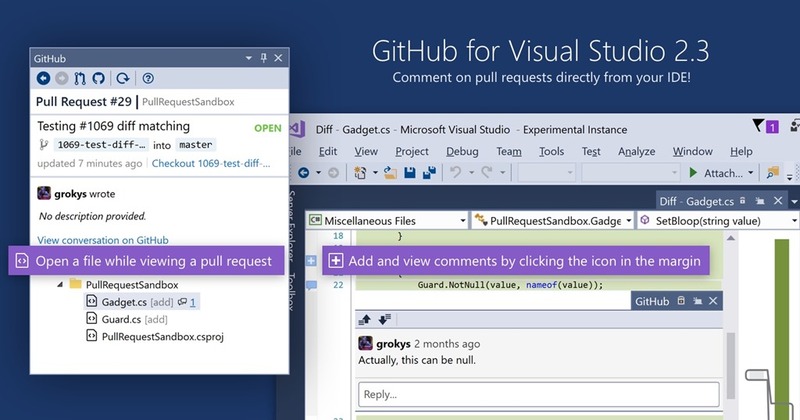 To get started you will need the latest version of GitHub Extension for Visual Studio. Next open up a pull request from the GitHub pane and while viewing a file you can click on the left gutter (see blue plus button) to add your feedback, all without leaving Visual Studio. This functionality is still pretty limited but its a step in the right direction. I look forward to more GitHub online functionality making it’s way to this great extension.